Religious opinion in Israel often sounds like a siren: one loud deafening voice drowns out all the rest. But throughout the Jewish tradition, voices in conflict have come together in text. Israeli society today, fraught as it is with discord and disagreement has a lot to learn from Talmudic diologue and its ability to incorporate conflicting voices into a harmonious symphony. Yeshivat Talpiot invites its students to learn to listen. With an emphasis on critical thinking, classes at Yeshivat Talpiot model liberal values based in a deep belief of the holiness of the Torah and of humanity. We empower students to build their own Jewish identity in a supportive communal environment. In turn, these diverse individuals come together to form a strong committed, multi-vocal, vibrant religious alternative. Yeshivat Talpiot is a new learning experience in Jerusalem that promotes open debate, liberal values and social justice through critical and committed study of traditional texts. Elul – Our flagship month-long intensive learning program serves post-army and university students. Young Israelis from a variety of religious backgrounds come together to study and pray from morning to evening, developing their own Jewish identities and forming a dynamic community. Evening Beit Midrash – Weekly learning sessions include hevrutah study and a class by our faculty. Open to our alumni and the public, Yeshivat Talpiot serves as a learning hub for established and budding egalitarian communities in Southern Jerusalem. Special Events - Alumni Shabbatonim, Seminars and Evenings in partnership with other communal organizations and local scholars continue the conversation we have begun in the Beit Midrash. Task Force on Jewish Law and Society: scholars and high level students create practical solutions to challenges of integrating religious and democratic values in Israeli society through online and in-person resources, position papers and articles, collaborative projects, and leadership development. Dr. Tali Berner (Steering Committee Member) is a mover and shaker in Jerusalem’s religious feminist movement and has held leadership positions in Kolech, Shira Hadasha and the Lafer Center for Women’s Studies at Hebrew University. Shoshana Cohen, (Founder and Director) teaches Midrash, Talmud and Gender Studies at the Conservative Yeshiva and at the Hartman Institute. A native of Los Angeles, she was on the founding faculty of Yeshivat Hadar in NY. Amit Gvaryhu (Executive Commitee and Faculty) was co-Scholar in Residence for a year at the Paidaia Institute of Jewish Studies and teaches Talmud at Drisha and Mechon Hadar in NY. He is a graduate student of Talmud at the Hebrew University. Shmuel Herr (Executive Committee and Faculty) is a master teacher of Talmud, pioneering a cutting edge method of teaching Talmud at the Hartman Institute, Kolot and Hebrew Union College’s Mistabra Beit Midrash. Yedidah Koren (Executive Committe and Faculty) was co- Scholar in Residence at the Paidea Institute of Jewish Studies and teaches Talmud at the Drisha Institute in New York. Yedidah has inspired and empowered women young and old through her Torah reading workshops in the US, Israel and Sweden. She is currently a graduate student of Talmud at Tel Aviv University. Dr. Jason Rogoff (Business Manager and Faculty) teaches Rabbinics at the Rothberg School at Hebrew University where he also holds a post-doctoral fellowship in Jewish Ethics. Alieza Salzberg, (Educational Director and Faculty) teaches Talmud and writing in Jerusalem, and leads classes and seminars at Pardes, Hevrutah, Matan, and Drisha in New York. 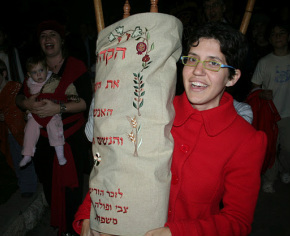 She is a graduate student of Rabbinic Literature at Hebrew University. Asaf Ziderman (Steering Committee and Faculty) teaches Jewish Philosophy at Tel Aviv University where he is also pursuing a doctorate on the nature of religious practice in the writings of 20th century Jewish thinkers. Currently the operating budget of Yeshivat Talpiot is primarily covered by in-kind donations and generous hours of volunteering and minimal tuition. With several programs currently running and a long-term plan for expansion, Yeshivat Talpiot needs your help to address the challenges facing liberal Jewish experience in Israel today. Yeshivat Talpiot also appreciates in-kind donations. U.S. Donations: Tax-exempt contributions of over $100 can be made to Yeshivat Talpiot via our fiscal sponsor, the New Israel Fund. The check should be made payable to “New Israel Fund” with "donor-advised to Yeshivat Talpiot 50065" in the memo line.